Most Top Brand Names have Google+ Pages - But ? BrightEdge found that 77 of the top 100 brands (as determined by Millward Brown’s Top 100 Most Valuable Global Brands 2011 list) now have G+ pages. In comparison, 93 of the top 100 have Facebook Pages. The total number of followers for those 77 brands is now 222,000 vs. 147,000 when BrightEdge took its first survey of G+ brand pages last month. 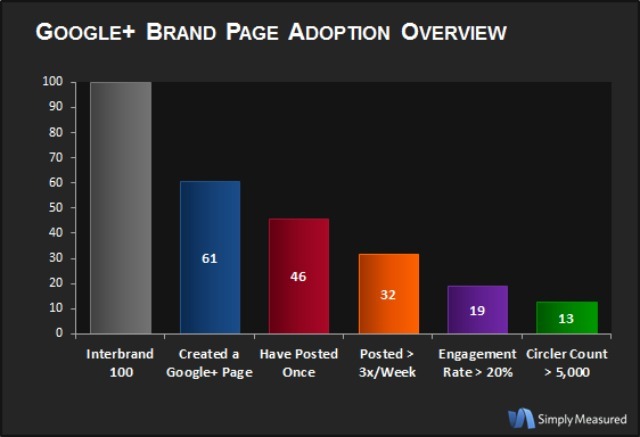 Meanwhile, Simply Measured, which looked at the Interbrand Top 100 Brands, found 61 had Google+ brand pages. However, only 13 of those top brands had followings of 5,000 or more, according to the researcher.